Ivan Moody is an English composer of church music who lives in Portugal. His Passion and Resurrection was commissioned by the Tampere International Choir Festival and first performed in Finland in 1993. The work tells the story of Christ’s birth, Passion and Resurrection in the well-loved English words of the Gospels. The music has a simple and austere beauty befitting this ‘greatest story ever told’. In his introductory notes to Passion and Resurrection, which appear on the inside cover of the published score, the composer Ivan Moody says: ‘The Passion is, I believe, at once the most difficult and yet the most important subject with which an artist may engage … and, for a composer, one of the central problems is whether it should be seen in largely dramatic terms, or whether, on the other hand, its ritual aspect should be brought to the fore.’ In the western European musical tradition it is the first of these methods that has usually been preferred, as exemplified in the stark and austerely beautiful St Matthew Passion of Heinrich Schütz, and at its height in the great St John and St Matthew Passions of Johann Sebastian Bach with their elaborate arias and distinctive chorales. However, for a composer who is an Englishman and yet has found his spiritual home in the Russian Orthodox Church, there is an immediate problem in setting religious texts, because the musical tradition of all the ancient Orthodox Churches, whether the language used was Greek, Latin or Syriac, is purely monophonic and unaccompanied (though it is true that in Russia the use of four-part harmony gradually entered Church music in the eighteenth century, and indeed persists to the present day). In addition, as Ivan Moody himself confesses, there has never been a tradition of dramatic presentation in the Orthodox Church, and during Holy Week the events of Christ’s sufferings unfold through the intensity of the services in a different way and are less obviously ‘dramatic’. These texts are full of references to the events and prophecies of the Old Testament, making echoes in heart and mind, resounding like the massive tolling bells of Russian monasteries and the xylophonic drumming of the semantron in Greece and on the Holy Mountain. But, there are also marked pre-echoes of the Resurrection of Christ on the third day. Indeed it is remarkable that in the Orthodox services, even on Good Friday itself, the faithful, though grieving as at a funeral for the death of Christ, never behave as if the Resurrection had never taken place, for the whole atmosphere is already filled with Resurrection joy. This makes the exact title of this work even more important: the Passion and Resurrection are inseparable. It contains and continues all the ‘bitter-sweet’ paradox of the fast of Great Lent itself. 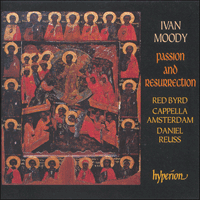 After receiving a commission from the Tampere International Choir Festival for a work to be performed at the 1993 festival, Ivan Moody completed his Passion and Resurrection on 21 April 1992, which happened to be the third day of Holy Week in the Orthodox Church. It was a significant and appropriate day because, like other, though older, contemporary composers such as Arvo Pärt and John Tavener, Ivan Moody’s whole being, as a person and as an artist, is rooted in the faith of the Holy Orthodox Church, so that he tries to combine the fruits of modern musical techniques and knowledge with those of the long, ancient and fundamental tradition of Christianity. All this appears at first as something utterly paradoxical, but that itself is typical of the Orthodox faith and life. The text for this work comes directly from the Gospels and from the Lenten Triodion, a book which contains the Holy Week Services of the Orthodox Church. It also includes a short phrase from a hymn by Saint Ephrem the Syrian (‘The Word of God has taken flesh and blood’). In compiling it, the composer takes as his basis the service of Twelve Gospels, which is the long Matins service of Great Friday. In its liturgical setting in the Orthodox church the gospel readings are at first very long and are interspersed with antiphons which reflect the subject-matter of what is being read; and then very gradually the readings and comments become shorter, so that psychologically the faithful feel a ‘lightening’ as the service progresses. Ivan Moody also uses the theme of Christ as the Bridegroom, which is emphasized on the first three days of Holy Week, as well as material from the Vespers for Good Friday, when the shroud of Christ is brought out into the middle of the church for veneration, and around which a ‘funeral lamentation’ takes place in the evening. But what is very striking is that in addition to these texts there is also the triumphal proclamation of the Resurrection, which is taken from, and indeed begins, the Pentecostarion, another liturgical book which contains all the services from Pascha (Easter) to Pentecost (Whitsun). The Gospel text is sung as it would be in a church service with fairly simple intoning, except that here another voice is introduced to sing the words of Christ, whereas in the church everything would be sung by the deacon or the priest without differentiation. The remaining text, which consists of hymns and canticles, is sung by the choir, which in turn is supported by a small instrumental ensemble of ‘strings and bells’, as if to echo words from Psalm 150. In addition to the voice of the Evangelist – a tenor ‘holding the story together’ – and the voice of Christ – sung by a bass as if representing the ‘ground’ of all creation – we also hear the voice of the Virgin Mary, the Mother of God, whose soprano register indicates that she is, of all mortals, ‘higher than the heavens’ and ‘more honourable than the cherubim and past compare more glorious than the seraphim’ as the church texts point out. These three seem to form a ‘triad’ of voices that are in communion together as one, but also remain distinct as persons – an image which is, in the mind of the composer, a certain reflection of the Holy Trinity. Although the whole work follows a liturgical order, Ivan Moody has divided it into further sections called ‘ikons’. This is a device which is now fairly familiar but which may benefit from some further explanation. In the Orthodox Churches and in people’s homes the ikons (pictures) of Christ and of His Mother and of His Saints, as well as of scenes from Christ’s earthly life, are painted on the walls or on wooden panels. There is also a wooden screen which divides the sanctuary from the main body of the church, or rather joins it to the nave, as the neck joins the head to the body, depending on which way you choose to view it. This screen, covered with ikons, is called the ikonostasis and it presents to the viewer a series of images for veneration. They are separate and yet intimately joined together. The Birth of Christ is indicated, not by familiar words from the synoptic narratives, but by the dogmatic statement of St John the Theologian about the Word (Logos) of God becoming flesh. The Last Supper is linked with today, the present, by the use of words spoken by the priest before communion: ‘Receive me today … I will not kiss Thee as did Judas.’ The Agony in the Garden has echoes of waiting for the coming of the Bridegroom, and of the wedding garment needed for the eucharistic feast in God’s Kingdom. The Trial before Pilate is set with great simplicity, and the Crucifixion sequence picks up the connection between the Tree of Life in the middle of the Garden of Eden and the Tree of Life, which is the Cross, set up in the midst of the world to give life to all. When Christ’s body is taken down from the Cross we hear a great lamentation as Joseph of Arimathea brings for burial the body of Him Who is a stranger in the flesh, a stranger to sin and evil and a stranger to corruption: and the Mother of God laments because of the fulfilment of the prophecy that ‘a sword shall pierce her heart’. The simple narrative of the Sealing of the Tomb leads directly into the proclamation of the Resurrection, using the words spoken by the priest at Pascha, when he invites all to come to the three-branched candlestick and receive the Light, the Light that has no evening. Then comes the solemn sound of the Slavonic chant at Pascha which accompanies a procession round the church, which now represents the empty tomb. It is the chant both of the angels and of mankind joining together to announce the Resurrection. Finally comes the chant ‘Khristos anesti’ (‘Christ is risen’) which conveys the whole flavour of Greek Pascha: and the work ends, as it began, with an Alleluia proclaiming glory to God. The ikons of the Orthodox Church are ‘written’ according to ‘strict canons’ – that is to say, they are the fruit of an ascetic struggle that is accompanied by prayer and fasting. Thus they are not the expression of the individual imaginings or of the ‘genius’ of the painter but they rather are intended to serve the whole community, expressing its common faith and underlining this in a manner which is acceptable to all and held by all. They represent, therefore, in a true sense an expression of catholicity, meaning ‘wholeness’, certainly not an ‘option’ or a matter of indifference. The persons depicted in the ikons are seen in their full and God-like nature, sober, grave and unsmiling; they do not ‘challenge’ us, nor do they supplicate our attention after the manner of television personalities, politicians or pop stars. On the contrary, they allow us to be ourselves, to respond or to withhold response, respecting the freedom of the human will. In the same way the Orthodox texts and the music which accompanies them are designed to allow us to respond without due pressure, without dominance. They do not overwhelm us with a volume of sounds from multifarious instruments or operatic voices, however ‘beautiful’ these may be considered to be in an abstract sense. This is the atmosphere in which Ivan Moody’s Passion and Resurrection was composed. Bearing this in mind, we can see the work as a subtle synthesis of apparently diverse elements in the musical tradition of Christianity, both in the East and in the West: but, if the word ‘pontifex’ does indeed mean ‘a bridge-builder’, then this is in truth a pontifical work. Dans ses notes introductives à Passion et Résurrection, disposées sur la couverture intérieure de la partition publiée, le compositeur Ivan Moody déclare: «La Passion est, je crois, le sujet le plus difficile, mais aussi le plus important, dans lequel un artiste puisse s’engager … et, pour un compositeur, l’un des problèmes centraux consiste à déterminer s’il faut la voir en termes essentiellement dramatiques, ou si son aspect rituel doit être mis en avant». La tradition musicale européenne occidentale a généralement préféré la première option, comme l’illustre la Passion selon saint Matthieu de Heinrich Schütz, dépouillée et austèrement magnifique, l’apogée de cette tendance se reflétant dans les grandes Passions selon saint Jean et saint Matthieu de Johann Sebastian Bach, avec leurs arias élaborées et leurs chorals distinctifs. Cependant, pour un compositeur qui est anglais mais a trouvé en l’Église orthodoxe russe sa demeure spirituelle, la mise en musique de textes religieux pose un problème immédiat, car la tradition musicale de toutes les Églises orthodoxes anciennes a toujours été purement monophonique, sans accompagnement, et ce que la langue utilisée fût le grec, le latin ou le syriaque (même si, dans la Russie du XVIIIe siècle, l’usage de l’harmonie à quatre parties gagna lentement la musique d’église, qui l’a conservé depuis). En outre, comme Ivan Moody le reconnaît lui-même, l’Église orthodoxe n’a jamais eu la tradition d’une présentation dramatique des événements et, durant la Semaine sainte, les souffrances du Christ se déploient, au gré de l’intensité des services, d’une manière différente et sont moins manifestement «dramatiques». Les textes, qui regorgent de références aux épisodes et aux prophéties de l’Ancien Testament, se répercutent dans le cœur et l’esprit, résonnant comme les massifs carillons des monastères russes, comme le tambourinage xylophonique des semantron en Grèce et sur la montagne sainte. Mais ils recèlent aussi des pré-échos prononcés de la résurrection du Christ le troisième jour. Il est en effet remarquable que dans les services orthodoxes, les fidèles, bien que pleurant la mort du Christ comme lors de funérailles, ne se comportent jamais, même le Vendredi saint, comme si la Résurrection n’avait jamais eu lieu, car l’atmosphère est déjà pénétrée de la joie de la Résurrection. Le titre exact de l’œuvre n’en est que plus important – Passion et Résurrection sont inséparables –, contenant et continuant tout le paradoxe «aigre-doux» du jeûne quadragésimal. Après que le Tampere International Choir Festival lui eut commandé une œuvre pour le festival de 1993, Ivan Moody acheva sa Passion et Résurrection le 21 avril 1992, le troisième jour de la Semaine sainte orthodoxe – jour important et opportun puisque Ivan Moody est, à l’instar d’autres compositeurs contemporains, mais plus âgés, tels Arvo Pärt et John Tavener, enraciné dans la foi de la sainte Église orthodoxe de tout son être d’individu et d’artiste, de sorte qu’il essaie de combiner le fruit des techniques et des connaissances musicales modernes aux acquis de la longue et ancienne tradition fondamentale du christianisme. Ce qui paraît tout d’abord complètement paradoxal mais est typique de la foi et de la vie orthodoxes. Le texte de l’œuvre provient directement des Évangiles et du Triodon quadragésimal, un livre contenant les services de la Semaine sainte de l’Église orthodoxe. Il comprend également une courte phrase extraite d’une hymne de saint Éphrem le Syriaque. Par cette compilation, le compositeur prend pour base le service des douze évangiles, qui est le long service des matines du grand vendredi. Telles que mises en musique dans l’Église orthodoxe, les lectures évangéliques commencent par être très longues et entrecoupées d’antiennes, reflets de la substance de ce qui est en train d’être lu; puis, très progressivement, les lectures et commentaires se font plus brefs, de sorte que les fidèles ressentent psychologiquement une «illumination» à mesure que le service progresse. Ivan Moody utilise aussi le thème du Christ-Marié, qui est accentué les trois premiers jours de la Semaine sainte, et un matériau tiré des vêpres du Vendredi saint, lorsque le linceul du Christ est apporté au cœur de l’église pour y être vénéré, ce linceul autour duquel une «lamentation funèbre» se déroule le soir. Mais, fait surprenant, ces textes se voient adjoindre la proclamation triomphale de la Résurrection, extraite du Pentecostarion – qu’elle débute d’ailleurs –, autre livre liturgique renfermant tous les services de Pascha (Pâques) à la Pentecôte. Pour sa mise en musique, le compositeur utilise trois langues: l’anglais liturgique du XVIIe siècle, le vieux slave (utilisé dans l’Église russe), et le grec ancien. La majeure partie de l’œuvre est, cependant, en anglais. Ivan Moody écrit à ce propos: «Le symbolisme de l’usage de ces trois langues est important pour moi, tout comme le fait qu’elles représentent à mes yeux les trois éléments – liturgique, musical et linguistique – sur lesquels je me sens le plus à même d’impliquer la tradition de l’Église orthodoxe telle qu’elle se rencontre dans les îles Britanniques». Le texte évangélique est chanté comme il le serait dans un service liturgique, avec une intonation assez simple, excepté qu’ici, une autre voix est introduite pour les paroles du Christ, alors que dans l’église, tout serait chanté par le diacre ou le prêtre, sans différenciation. Le reste du texte, constitué d’hymnes et de cantiques, est chanté par le chœur, à son tour soutenu par un petit ensemble instrumental de «cordes et cloches», comme pour faire écho aux paroles du psaume 150. Outre les voix de l’Évangéliste – un ténor «assurant l’unité de l’histoire» – et du Christ – une basse symbolisant le «fondement» de toute la création –, nous entendons celle de la Vierge Marie, Mère de Dieu, dont le registre de soprano indique qu’elle est, de tous les mortels, «plus haute que les cieux», «plus honorable que les chérubins et, au-delà de toute comparaison, plus glorieuse que les séraphins», comme le soulignent les textes de l’Église. Ces trois voix, qui forment une «triade», sont en communion pour ne faire qu’une, mais demeurent distinctes en tant que personnes – une image qui est, dans l’esprit du compositeur, un certain reflet de la Sainte Trinité. Bien que respectant un ordre liturgique, l’œuvre entière est divisée en sections appelées «icônes». Ce procédé requiert quelques explications. Dans les églises orthodoxes et dans les maisons, des icônes (images) du Christ, de Sa Mère et de Ses Saints, ainsi que des scènes de la vie terrestre du Christ, sont peintes sur les murs ou sur des panneaux en bois. Un écran en bois sépare également le sanctuaire du corps principal de l’église, ou plutôt le relie à la nef, comme le cou unit la tête au corps, selon la manière dont vous choisissez de le considérer. Cet écran couvert d’icônes est appelé ikonostasis et présente une série d’images destinées à la vénération, distinctes mais pourtant intimement liées. A l’identique, Passion et Résurrection forme une série de huit «icônes»: I: La naissance du Christ; II: La Cène avec Ses apôtres; III: Son agonie dans le jardin de Gethsémani; IV: Son procès devant le gouverneur romain Ponce Pilate; V: Sa crucifixion; VI: La descente de Son corps de la Croix; VII: Le scellement de Son Tombeau; VIII: Sa Résurrection d’entre les morts le troisième jour. La naissance du Christ est indiquée non par des mots familiers tirés des récits synoptiques mais par l’énonciation dogmatique de saint Jean sur le Verbe (Logos) de Dieu se faisant chair. La Cène est reliée à aujourd’hui, au présent, par l’usage de paroles prononcées par le prêtre avant la communion: «Reçois-moi aujourd’hui … Je ne t’embrasserai pas comme le fit Judas». L’agonie dans le jardin présente des échos de l’attente de la venue du Marié, et du vêtement de mariage requis pour le festin eucharistique au royaume de Dieu. Le jugement devant Pilate est énoncé avec une grande simplicité, tandis que la séquence de la crucifixion reprend le lien entre l’Arbre de Vie au cœur du jardin d’Eden et l’Arbre de Vie, savoir la Croix, dressé au cœur du monde pour donner vie à tous. A la descente du corps du Christ de la Croix, une grande lamentation survient lorsque Joseph d’Arimathie apporte, pour l’inhumer, le corps de Celui qui est un étranger dans la chair, un étranger au péché et au mal, un étranger à la corruption; et la Mère de Dieu se lamente car la prophétie «une épée percera son cœur» se réalise. La narration simple du scellement du tombeau mène directement à la proclamation de la Résurrection, en utilisant les mots prononcés par le prêtre à Pascha, lorsqu’il invite chacun à venir au chandelier à trois branches recevoir la Lumière, la Lumière qui ne connaît pas de soir. Suit alors la solennité du chant slavon de Pascha, qui accompagne une procession autour de l’église, désormais symbole du tombeau vide. Ce chant est celui et des anges et de l’humanité, unis pour annoncer la Résurrection. Arrive enfin le chant «Khristos anesti» («Christ est ressuscité»), qui véhicule toute la saveur de la Pascha grecque; et l’œuvre s’achève, comme elle débuta, par un alléluia proclamant gloire à Dieu. Les icônes grecques sont «écrites» selon des «canons stricts» – ce qui signifie qu’elles sont le fruit d’une lutte ascétique, accompagnée de prières et de jeûne. N’exprimant ainsi ni des représentations individuelles, ni le «génie» du peintre, elles sont plutôt destinées à servir la communauté toute entière, dont elles traduisent la foi en la soulignant d’une manière acceptable et acceptée par tous. En conséquence, il s’agit vraiment d’une expression de catholicité, au sens premier d’«intégralité», et certainement pas d’une «option» ou d’une question insignifiante. Les personnes représentées dans les icônes sont dépeintes dans leur pleine nature divine, sobres, graves et austères: elles ne nous «défient» pas, pas plus qu’elles n’implorent notre attention, à la manière des personnalités télévisuelles, des politiciens ou des vedettes pop. Au contraire, elles nous permettent d’être nous-mêmes, de répondre, si nous le souhaitons, ou de refuser de le faire, si tel est notre désir. Elles respectent la liberté de la volonté humaine. A l’identique, les textes orthodoxes des services, et la musique qui les accompagne, sont conçus pour nous permettre de répondre sans pression, sans dominance. Ils ne nous submergent pas d’un volume sonore issu d’instruments multiples et de voix d’opéra, quelque «magnifiques» que ces derniers puissent être considérés d’un point de vue abstrait. Telle est l’atmosphère qui présida à la composition de Passion et Résurrection et, en la gardant présente à l’esprit, nous pouvons voir cette œuvre comme une subtile synthèse d’éléments apparemment divers de la tradition musicale du christianisme, en Orient comme en Occident; et puisque le mot «pontifex» signifie en fait «constructeur de ponts», alors cette œuvre est, en vérité, pontificale. Im Vorwort zur gedruckten Ausgabe seiner Partitur von Passion and Resurrection schreibt Ivan Moody: ‘Die Passion, so glaube ich, ist gleichzeitig das schwierigste und bedeutendste Thema, mit dem sich ein Künstler befassen kann … Eine der wichtigsten Fragen für den Komponisten ist hierbei, ob sie vorwiegend unter dem dramatischen oder dem rituellen Gesichtspunkt zu betrachten ist.’ In der westeuropäischen Musiktradition wurde für gewöhnlich die erste Betrachtungsweise vorgezogen. Beispiele dafür sind die strenge und nüchtern-schöne Matthäuspassion von Heinrich Schütz und die großartige Johannes- bzw. Matthäuspassion von Johann Sebastian Bach, die mit ihren kunstvollen Arien und unverkennbaren Chorälen die Blütezeit der Passion beschreiben. Ein Komponist englischer Herkunft, der zudem die russisch-orthodoxe Kirche als seine geistige Heimat gewählt hat, trifft bei der Vertonung religiöser Texte jedoch zugleich auf ein erhebliches Problem, da die Musiktradition der orthodoxen Kirche – gleich ob die Sprache Griechisch, Latein oder Syrisch ist – ausschließlich monophone und unbegleitete Musik aufweist (obgleich es der vierstimmigen Harmonik im 18. Jahrhundert gelang, in die russische Kirchenmusik vorzudringen und sich dort zu behaupten). Darüber hinaus, so bestätigt Ivan Moody selbst, wurde die dramatische Darstellung in der orthodoxen Kirche nie propagiert: In der Passionswoche offenbart sich die Leidensgeschichte Christi durch die Intensität der Gottesdienste auf unterschiedliche und weniger ‘dramatische’ Weise. Die Texte beziehen sich vielerorts auf die Geschichten und Prophezeiungen des alten Testaments, welche im Herzen und im Geiste nachhallen und das Echo von Glocken russischer Klöster und xylophonischem Trommeln vom Semantron in Griechenland und dem Heiligen Berg vernehmbar werden lassen. Am dritten Tag zeichnet sich dann jedoch ganz unverkennbar die Auferstehung Christi ab. Es ist fürwahr erstaunlich, daß die Gläubigen während der orthodoxen Gottesdienste den Tod Christi zwar beklagen, doch niemals – nicht einmal am Karfreitag – den Glauben an die Auferstehung verlieren, denn die ganze Atmosphäre ist bereits erfüllt von der Freude und Vorfreude auf dieses Ereignis. Dieses Verhalten gibt dem Titel von Moodys Werk um so mehr Berechtigung: Die Passion und die Auferstehung sind eine untrennbare Einheit. Das ganze ‘bitter-süße’ Paradoxon der Fastenzeit wird erfaßt und weitergeführt. Nachdem Ivan Moody den Auftrag erhalten hatte, eine Komposition für das 1993 stattfindende Internationale Chor-Festival von Tampere zu schreiben, vollendete er am 21. April 1992 sein Werk Passion and Resurrection. Dieser Tag war zufällig der dritte Tag der Passionswoche der orthodoxen Kirche und daher von großer Bedeutung und Relevanz für Ivan Moody, dessen ganzes Sein und Streben, sei es als Mensch oder als Künstler, wie im Falle vieler älterer zeitgenössischer Komponisten, z. B. Arvo Pärt und John Tavener, tief im Glauben der Heiligen Orthodoxen Kirche verankert ist. Demzufolge versucht er auch, moderne Musiktechniken und heutiges Wissen mit der jahrtausendealten und fest verwurzelten Tradition des Christentums zu verbinden. Dies scheint auf den ersten Blick völlig paradox zu sein, ist jedoch in sich selbst kennzeichnend für den orthodoxen Glauben und das orthodoxe Leben. Der Text seines Werkes wurde direkt aus den Evangelien und dem Fasten-Triodion übernommen – einem Buch, in dem alle Gottesdienste der orthodoxen Kirche für die Passionswoche aufgeführt sind – und enthält außerdem eine kurze Phrase aus einer Hymne von Ephräm dem Syrer. Als Textgrundlage wählte der Komponist den Gottesdienst der zwölf Evangelien – die lange Matutinmesse des Karfreitags. Gemäß der Liturgie der orthodoxen Kirche sind die Lesungen der Evangelien anfangs sehr lang und von Antiphonen unterbrochen, welche den Inhalt des Gelesenen wiedergeben. Dann werden die Lesungen und Reden allmählich kürzer, so daß die Gemeinde im weiteren Gottesdienstverlauf ein Gefühl geistiger ‘Erleichterung’ verspürt. Ivan Moody greift auch das Thema von ‘Christus dem Bräutigam’ auf, dem während der ersten drei Tage der Passionswoche besondere Bedeutung beigemessen wird. Er verwendet außerdem Material aus den Karfreitagsvespern, wenn das Leichentuch Christi zur Anbetung in der Kirchenmitte aufgebahrt wird und am Abend Mittelpunkt einer Trauerandacht ist. Erstaunlich ist jedoch, daß sich zu diesen Texten eine triumphale Verkündigung der Auferstehung gesellt, die aus dem Pentecostarion, einem Liturgienbuch mit einer Aufführung aller Gottesdienste für die Zeit zwischen Pascha (Ostern) und Pentecoste (Pfingsten), stammt und dieses Buch genau genommen eröffnet. Der Evangeliumstext wird wie in einem Kirchengottesdienst gesungen, mit recht einfach gehaltener Intonation. Der einzige Unterschied ist, daß hier eine weitere Stimme zum Singen der Worte Christi eingeführt wird (in der Kirche werden jene Worte ausnahmslos vom Diakon oder Priester gesungen). Der restliche, aus Hymnen und Cantica bestehende Text wird vom Chor übernommen, der wechselweise von einem kleinen Instrumentalensemble mit ‘Streichern und Glocken’ unterstützt wird, als wenn die Worte des Psalms 150 hier imitiert werden sollten. Neben der Stimme des Predigers – einem Tenor, der ‘das Ganze zusammenhält’ – und der Stimme von Christus – die von einem Bass quasi als Ausdruck der ‘Schöpfungsgrundlage’ übernommen wird – ist auch die Heilige Jungfrau Maria, die Mutter Gottes, zu hören. Ihre Stimmlage, der Sopran, drückt aus, daß sie als einzige Sterbliche, ‘höher als der Himmel’ und ‘ehrwürdiger als ein Cherubim und glorreicher als ein Seraphim ist’; so steht es in den Kirchentexten geschrieben. Diese drei Personen scheinen einerseits zu einer Einheit zu verschmelzen und mit ihren Stimmen einen ‘Dreiklang’ zu formen, bleiben jedoch andererseits als individuelle Persönlichkeiten bestehen – dieses Bild, das dem Komponisten vor Augen schwebte, ist in gewisser Weise ein Spiegelbild der Heiligen Dreifaltigkeit. Obgleich das Werk einer liturgischen Ordnung unterliegt, hat Ivan Moody sein Stück in weitere Abschnitte unterteilt, die er ‘Ikonen’ nennt. Diese Technik ist heutzutage recht bekannt, da sich John Tavener ihrer ausgiebig bediente. Sie bedarf dennoch einiger Erläuterungen. In den orthodoxen Kirchen und Häusern der Gläubigen werden Ikonen (Bilder) von Christus, seiner Mutter und den Heiligen sowie Szenen aus Christus’ irdischem Leben auf Wände oder Holztafeln gemalt. In den Kirchen befindet sich zudem eine Holzwand, die – je nach Betrachtungsweise – den Altarraum vom Gemeinderaum trennt oder ihn mit dem Kirchenschiff verbindet, so wie Kopf und Körper durch den Hals verbunden werden. Diese mit Ikonen übersähte Wand heißt Ikonostase und präsentiert dem Betrachter eine Folge von Bildern der Anbetung und Verehrung, die alle voneinander unabhängig und doch gleichzeitig eng miteinander verbunden sind. Auf ähnliche Weise stellt auch Passion and Resurrection eine Reihe von insgesamt acht ‘Ikonen’ dar: I: Die Geburt Christi; II: Sein letztes Abendmahl mit seinen Jüngern; III: Sein Leiden im Garten von Gethsemane; IV: Sein Prozeß vor dem römischen Prokurator Pontius Pilatus; V: Seine Kreuzigung; VI: Die Abnahme seines Leibes vom Kreuz; VII: Die Versiegelung seines Grabes; VIII: Seine Auferstehung von den Toten am dritten Tage. Die Geburt Christi wird nicht etwa durch die vertrauten Worte synoptischer Erzählungen kundgetan, sondern durch die dogmatische Verkündigung von Johannes dem Evangelisten, daß das Wort Gottes (Logos) Fleisch geworden sei. Das letzte Abendmahl wird durch die vom Priester vor der Kommunion gesprochenen Worte: “Empfang mich heute … ich werde Dich nicht küssen, wie es Judas tat” mit dem Heute, der Gegenwart, verbunden. Im Garten von Gethsemane klingt das Warten auf die Ankunft des Bräutigams sowie des Hochzeitsgewands für das eucharistische Fest im Reiche Gottes an. Die Vertonung des Prozesses vor Pilatus ist von grandioser Schlichtheit, und der darauffolgende Kreuzigungsteil beschreibt die Verbindung zwischen dem Baum des Lebens im Garten Eden und dem Baum des Lebens (das Kreuz), der in der Welt aufgestellt wurde, um der Menschheit Leben zu spenden. Christus’ Leib wird nun vom Kreuz genommen, und es erhebt sich lautes Wehklagen, als Joseph von Arimathea den Leichnam jenes Mannes zu Grabe trägt, dem das Fleisch, die Sünde, das Böse und die Verderbnis fremd sind; und die trauernde Mutter Gottes beklagt die Erfüllung der Prophezeiung, daß ‘ein Schwert ihr Herz durchbohren wird’. Die schlichte Erzählung der Grabversiegelung leitet ohne Umschweife zur Verkündigung der Auferstehung über, wobei jene Worte verwendet werden, die der Priester zu Pascha (Ostern) spricht, wenn er die Gemeinde auffordert, zum dreiarmigen Kerzenhalter zu kommen, um dort das Licht zu empfangen, das ewige Licht. Dann erklingt der feierliche slawische Pascha-Gesang, von dem die Prozession um die Kirche, welche nun das leere Grab symbolisiert, begleitet wird. In diesem Gesang vereinen sich die Engel und die Menschheit, um gemeinsam die Auferstehung kundzutun. Abschließend folgt der Gesang ‘Khristos anesti’ (‘Christus ist auferstanden’), der die ganze Atmosphäre des griechischen Pascha spürbar werden läßt. Das Werk endet genauso, wie es begann, mit einem Halleluja zur Ehre Gottes. Die Ikonen der orthodoxen Kirche sind gemäß ‘strenger Kanons geschrieben’, d.h. sie sind die Früchte asketischer Bemühungen, die von Gebeten und Fasten begleitet werden. Daher sind sie kein Ausdruck der persönlichen Vorstellung oder des ‘Genius’ des Künstlers, sondern sollen vielmehr der ganzen Gemeinde dienen, indem sie deren gemeinsamen Glauben darstellen und auf eine allgemein befürwortete und geachtete Weise zum Ausdruck bringen. Die Ikonen sind folglich im wahrsten Sinne des Wortes ein Ausdruck von Allgemein­gültig­keit, das heißt ‘Gesamtheit’, und haben nichts mit ‘Wahlfreiheit’ oder Gedankenlosigkeit zu tun. Die in den Ikonen dargestellten Personen präsentieren sich uns in ihrer reinen und nahezu göttlichen Natur; ernst, streng und ohne ein einziges Lächeln. Sie ‘fordern’ uns nicht ‘heraus’, noch ringen sie um unsere Aufmerksamkeit, wie es Fernsehpersönlichkeiten, Politiker oder Popstars tun. Ganz im Gegenteil: Sie erlauben uns, wir selbst zu sein, zu antworten, falls wir dies wünschen, oder zu schweigen. Sie respektieren den freien Willen des Menschen. Auf eben solche Weise lassen uns auch die Texte der orthodoxen Gottesdienste und die begleitende Musik die Freiheit, uns ohne Druck oder Zwang zu offenbaren. Wir werden nicht mit einer Klangfülle zahlloser Instrumente und Opernstimmen überwältigt, wie ‘schön’ man diese abstrakt betrachtet auch finden mag. In einer solchen Atmosphäre entstand auch Ivan Moodys Passion and Resurrection, und in diesem Wissen können wir das Werk als eine gelungene Synthese diverser Elemente der christlichen Musiktradition des Ostens und des Westens betrachten. Sollte die Bedeutung des Wortes ‘pontifex’ jedoch in der Tat ‘Brückenbauer’ sein, so handelt es sich hier wahrhaftig um ein pontifikales Werk.